JOHNSTON — Verldean Bell of Johnston, Iowa, 93, passed away on Friday, August 17, 2018, at her home at Bishop Drumm Care Cen­ter in John­ston, Iowa. A celebration of life will be held at 10 a.m. on Saturday, September 15, 2018 at Hamilton’s on Westown Parkway, 3601 Westown Parkway in West Des Moines. The visitation will take place the hour preceding the service. Burial of the cremains will occur at a graveside service the same day at 3 p.m. at Memorial Park Cemetery in Fort Dodge. Verldean was born to Irvin and Hattie (Beshey) Morrison in Webster City, IA and grew up in the Woolstock-Webster City area, graduating from Webster City High School in 1941. She married Virgil Bell of Fort Dodge, IA on October 18, 1942 at her parents’ home in Webster City. Virgil and Verldean made their home in Fort Dodge where they raised five children until 1986. Verldean was employed by The First American State Bank as a bank teller and savings counselor for 16 years, retiring in 1985. Verldean and Virgil moved to Rogers, AR in 1986. In 2007, they moved to Bishop Drumm Retirement Center in Johnston. Verldean was a faithful member of Grace Lutheran Church in Fort Dodge and Peace Lutheran Church in Rogers. 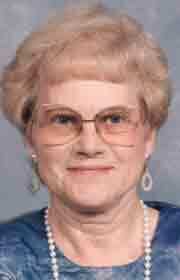 She was an active member of the American Legion Auxiliary in Rogers. Verldean enjoyed traveling and wintering in Arizona during her Arkansas retirement years, belonging to a card club for decades in Fort Dodge, and participating in church circles for more than 60 years. Her interests included spending time with family, baking delicious pies, solving daily crossword puzzles, gardening and crocheting. Verldean will be dearly missed by her children; Carol (Bill) Hendricks of Kimberling City, MO, Marla (Jerry) Skadburg of Sioux City, IA, Kristin (Jeffrey) Strothcamp of Ankeny, IA, Steven (Terri) Bell of Pevely, MO; son-in-law James Koenig; brother-in-law, Richard Gabbert; eight grandchildren; ten great-grandchildren and her nieces and nephews. Verldean was preceded in death by her husband of 72 years, Virgil; her parents; her daughter, Kathleen Koenig; her sisters, LaVonne Gabbert and Clarine Baker; one grandson and two nephews. Memorials may be made to the Michael J. Fox Foundation for Parkinson’s Research. Condolences may be expressed at: www.Hamiltons­FuneralHome.com.